Copyright in the pages, in the screens displaying the pages and in the information, materials and other content contained in this web site is owned by PrinsBank unless other wise indicated and is protected by U.S. and international copyright laws and treaties. The information, materials and other content of this web site may not be copied, displayed, distributed, downloaded, licensed, modified, published, reposted, reproduced, reused, sold, transmitted, used to create a derivative work, or otherwise used for public or commercial purposes without the express written consent of PrinsBank. Information, materials, products, and services on this web site are subject to change. Not all products and services may be available in all geographic areas. Your eligibility for particular products or services is subject to determination by and the approval of PrinsBank. No solicitation is made by PrinsBank to any person to use any information, materials, products, or services in any jurisdiction where the provision of such information, materials, products and services is prohibited by law. 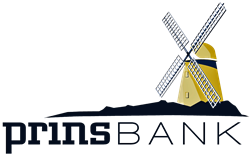 PrinsBank does not warrant the accuracy, adequacy, timeliness of the information, materials, products, and services on this web site. All information, materials, products, and services are furnished "as is" and "as available." No warranty of any kind, express or implied, including but not limited to the warranties of non-infringement of third party rights, title, merchantability, fitness for a particular purpose, and freedom from computer virus is given in conjunction with the information, materials, products, and services. In NO EVENT SHALL PrinsBank be liable for any damages, losses or liabilities including without limitation, direct or indirect, special incidental, consequential damages losses or liabilities, in connection with the use of this web site or your reliance on or use or inability to use the information, materials, products, and services on this web site, or in connection with any failure of performance, error, omission, interruption, defect, delay in operation or transmission, computer virus or system failures, even if PrinsBank is advised of the possibility of such damages, losses or expenses. The use of the hyperlinks on this web site to other Internet sites is at your own risk. PrinsBank is not responsible for the content or accuracy of third party sites hyperlinked from this web site nor does it guarantee the products or services offered on third party sites. You should review the privacy statements of a web site before you provide any personal or confidential information. Your use of this web site is governed by state and applicable federal law. PrinsBank is not responsible for the content of third party sites hyperlinked from this page, nor does it guarantee the products or services offered on third party sites. You should review the privacy statement of a website before you provide personal or confidential information.